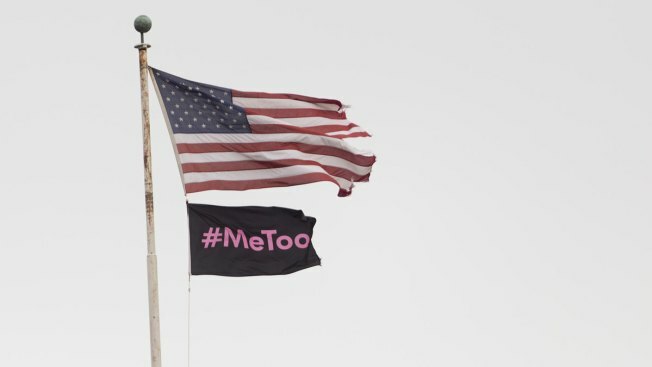 This Nov. 29, 2018, file photo shows a #MeToo flag fly below an American flag in Portland, Maine. Only about a third of Americans say women have made "major gains" toward equal rights in the past year, which saw the #MeToo movement and a record number of women elected to Congress, according to a new NBC News/Wall Street Journal poll. Overall, men and women have similar views on how much progress has been made in the year. Democratic women remain particularly pessimistic about the gender equality fight over the long term — about a third of them said women have made major gains in the last 10 years, whereas about half of Republican women and men of both parties saw major gains in the same time frame. The same percentage of Americans, 46, say women have made major gains toward equality in the past decade as they did in a Merit Report poll in 1982.